Contemporary ottoman on wheels covered in Pat McGann Studio raw tussar silk and cotton upholstery fabric. 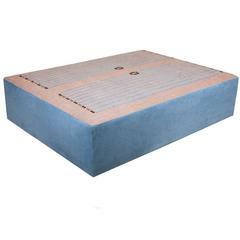 Upholstery weight fabric and ottoman available to order. Contemporary ottoman on wheels covered in Pat McGann Studio raw tussar silk and wool fabric. Fabric and ottoman available to order. 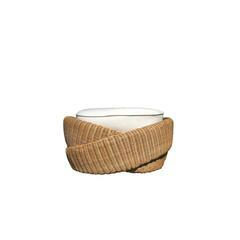 A Hollywood Regency style cube footstool in a handwoven tweed fabric. An ottoman with the top a handwoven textile by Kerstin Sundberg-Asling, in a linear design of oranges and blues. 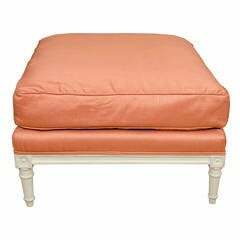 Louis XVI style ottoman in coral silk fabric. 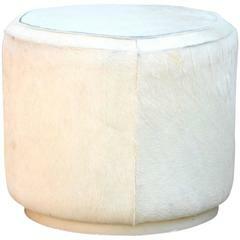 Hide covered cylinder ottoman stool.